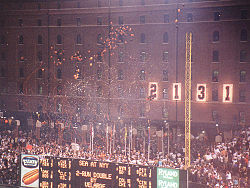 The Orioles experienced their greatest success from 1966 to 1983, when they made six World Series appearances, winning three of them (1966, 1970, 1983). 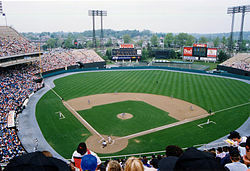 This era of the club featured several future Hall of Famers who would later be inducted representing the Orioles, such as third baseman Brooks Robinson, outfielder Frank Robinson, starting pitcher Jim Palmer, first baseman Eddie Murray, shortstop Cal Ripken Jr., and manager Earl Weaver. The Orioles have won a total of nine division championships (1969–1971, 1973–1974, 1979, 1983, 1997, 2014), six pennants (1966, 1969–1971, 1979, 1983), and three wild card berths (1996, 2012, 2016). Since moving to Baltimore in 1954, the franchise has a win-loss record of 5252-5066 (with a winning "percentage" of .509) as of the end of the 2018 season. After suffering a stretch of 14 straight losing seasons from 1998 to 2011, the team qualified for the postseason three times under manager Buck Showalter and general manager Dan Duquette, including a division title and advancement to the American League Championship Series for the first time in 17 years in 2014. However, the 2018 team finished with a franchise-worst record of 47–115, prompting the team to move on from Showalter and Duquette following the season's conclusion. The Orioles' current manager is Brandon Hyde, while Mike Elias serves as general manager and executive vice president. At the end of the 1900 season, the American League removed itself from baseball's National Agreement (the formal understanding between the NL and the minor leagues). Two months later, the AL declared itself a competing major league. As a result of several franchise shifts, the Brewers were one of only two Western League teams that didn't fold, move or get kicked out of the league (the other being the Detroit Tigers). In its first game in the American League, the team lost to the Detroit Tigers 14–13 after surrendering a nine-run lead in the 9th inning. To this day, it is a major league record for the biggest deficit overcome that late in the game. In the first American League season in 1901, they finished last (eighth place) with a record of 48–89. Its lone Major League season, the team played at Lloyd Street Grounds, between 16th and 18th Streets in Milwaukee. The team's first year without Ripken saw the team with a record of 63–63 at the conclusion of play on August 23, but then proceed to lose 32 of its last 36 games of the season, including their final 12 in a row to finish the season 67–95. In an effort to right the Orioles' sinking ship, changes began to sweep through the organization in 2003. General manager Syd Thrift was fired and to replace him, the Orioles hired Jim Beattie as executive vice-president and Mike Flanagan as the vice president of baseball operations. After another losing season, manager Mike Hargrove was not retained and Yankees coach Lee Mazzilli was brought in as the new manager. The team signed powerful hitters in SS Miguel Tejada, C Javy López, and former Oriole 1B Rafael Palmeiro. The following season, the Orioles traded for OF Sammy Sosa. On June 4, with an 8-game losing streak and the worst record in the league at 15–39, the Orioles replaced Dave Trembley as manager with third base coach Juan Samuel as interim manager. They did well at first, but then they started losing again, going 17–34 under Samuel. The Orioles hired Buck Showalter on July 29 to be the full-time manager. He was introduced on August 2 and made his debut on August 3, after the Orioles fired Samuel. Showalter's arrival produced, or coincided with, a turnaround; the Birds went 34–23 under Showalter to finish 66–96. In Baltimore, Orioles games on radio can be heard over WJZ-FM (105.7 FM). Jim Hunter and Kevin Brown alternate as play-by-play announcers. WJZ-FM also feeds the games to a network of 36 stations, covering Washington, D.C. and all or portions of Maryland, Pennsylvania, Delaware, Virginia, West Virginia, and North Carolina. Six former Oriole franchise radio announcers have received the Hall of Fame's Ford C. Frick Award for excellence in broadcasting: Chuck Thompson (who was also the voice of the old NFL Baltimore Colts); Jon Miller (now with the San Francisco Giants); Ernie Harwell, Herb Carneal; Bob Murphy and Harry Caray (as a St. Louis Browns announcer in the 1940s). The Orioles also have an official team hall of fame, located on display on Eutaw Street at Camden Yards. The most recent inductees were Brian Roberts and Fred Manfra. ^ "Orioles announce uniform changes for 2012". Orioles.com (Press release). MLB Advanced Media. November 15, 2011. Retrieved March 19, 2017. The club's new home cap will feature the cartoon bird on a white front panel with a black back and orange bill and button. ^ "Orioles Logos & Mascots". Orioles.com. MLB Advanced Media. Retrieved June 16, 2018. ^ punkrawka (January 28, 2013). "The 2012 Orioles: the DVD". Camden Chat. ^ "Baltimore Orioles Team History & Encyclopedia". Baseball-Reference.com. ^ Kamin, Blair. "Camden Yards paved a retro revolution — and influenced Wrigley Field's renovations". Chicago Tribune. ^ Weigel, Brandon. "A More Complex Legacy: Oriole Park is known as "the ballpark that forever changed baseball," and its impact may well extend to local governing". Baltimore City Paper. ^ "Events of Thursday, April 25, 1901". Retrosheet.org. April 25, 1902. Retrieved November 23, 2012. ^ Bialik, Carl (July 28, 2008). "Baseball's Biggest Ninth-Inning Comebacks". The Wall Street Journal. ^ "The Oriole Bird". Baltimore Orioles. Retrieved November 23, 2012. ^ Flynn, Tom (2008). Baseball in Baltimore. Maryland: Arcadia Publishing. p. 67. ISBN 978-0-7385-5325-2. ^ "Baltimore Orioles (1954–Present)". Sportsecyclopedia.com. Retrieved November 23, 2012. ^ "Poor Communication at Heart of Feud". The Washington Post. May 12, 1998. ^ "O's stage historic comeback vs. Red Sox". mlb.mlb.com. June 30, 2009. Retrieved April 9, 2011. ^ "Orioles pick up option on Trembley". mlb.mlb.com. Retrieved April 9, 2011. ^ "Record-Low Crowd Watches Orioles Sink Even Lower". wnst.net. Archived from the original on September 27, 2017. Retrieved September 27, 2017. ^ "MLB Standings on April 25th 2010". MLB.com. Retrieved October 3, 2017. ^ "Trembley fired; Samuel takes over". ESPN. June 5, 2010. Archived from the original on September 27, 2017. Retrieved September 27, 2017. ^ a b Paul Lebowitz (March 8, 2011). Paul Lebowitz's 2011 Baseball Guide: A Complete Guide to the 2011 Baseball Season. iUniverse. pp. 66–67. ISBN 978-1-4620-0232-0. ^ "Orioles hire Buck Showalter as manager – Daily Pitch: MLB News, Standings, Schedules & More". USA Today. July 29, 2010. Archived from the original on September 27, 2017. Retrieved April 9, 2011. ^ "2012 Baltimore Orioles Schedule and Results". Baseball-Reference.com. Retrieved January 24, 2017. ^ Mastrodonato, Jason (September 18, 2013). "Orioles set errorless game record in victory". Retrieved September 19, 2013. ^ "Major League Baseball : Scoreboard". mlb.com. Retrieved June 19, 2015. ^ "O's make history with 18 runs vs. Red Sox". Major League Baseball. Retrieved June 19, 2015. ^ "Orioles hit eight homers and destroy Phillies". Philly.com. June 17, 2015. Retrieved June 19, 2015. ^ Connolly, Dan. "Orioles tie franchise record with 26 hits in 18-2 win over Oakland A's". The Baltimore Sun. ^ "Orioles overpower Royals with slams in eighth". MLB.com. ^ Brendan Kennedy (October 1, 2015). "Blue Jays' celebration delayed, but worth the wait for AL East title". The Star. Retrieved September 16, 2018. ^ Ghiroli, Brittany (April 27, 2015). "Protests force postponement of O's-White Sox on Monday". The Baltimore Orioles. MLB. Retrieved April 28, 2015. ^ "Orioles announcement regarding schedule changes". @Baltimore Orioles (twitter). Baltimore Orioles. Retrieved April 28, 2015. ^ "Orioles, White Sox will play in empty Baltimore stadium Wednesday". News & Record. Associated Press. April 28, 2015. Retrieved April 29, 2015. ^ "MLB Baseball Box Score – Chicago vs. Baltimore – Apr 29, 2015". CBSSports.com. Retrieved June 19, 2015. ^ Brittany, Ghiroli (April 28, 2015). "White Sox-O's postponed; tomorrow closed to fans". The Baltimore Orioles. MLB.com. Retrieved April 28, 2015. ^ "Orioles Game Vs. White Sox Postponed Following Baltimore Riots". WJZ-TV. CBS Baltimore. Retrieved April 28, 2015. 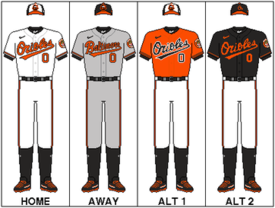 ^ "Battle of the Uniforms: Orioles win title". ESPN.com. Retrieved June 19, 2015. ^ Zurawik, David. "After 64 years, no lineup of Orioles games will be on Baltimore broadcast TV in 2018". Baltimore Sun. ^ Lee, Edward. "'It was like a home game' vs. Panthers, said Ravens quarterback Joe Flacco". The Baltimore Sun. Retrieved May 28, 2011. ^ "Ravens hold on to win Super Bowl, 34–31". The Baltimore Sun. February 4, 2013. Retrieved April 13, 2016. ^ Steinberg, Dan (August 10, 2016). "Baltimore's National Anthem 'Oh!' gives Michael Phelps a gold-medal laugh". D.C. Sports Bog. The Washington Post. ^ Gibbons, Mike (July 5, 2007). "Baltimore's Seventh-Inning Tradition Within a Tradition". pressboxonline.com. Retrieved April 9, 2011. ^ "John Denver At Camden Yards | 7th-inning stretch belonged to Denver Orioles: Time after time, 'Thank God I'm a Country Boy' got the stadium rocking. And when the man himself joined in, it was magic". Baltimore Sun. October 14, 1997. Retrieved November 23, 2012. ^ Walt Woodward (1970). "Orioles Magic (Feel It Happen)". The Baltimore Sun. Retrieved October 12, 2014. ^ "August 1997". baseballlibrary.com. Retrieved November 23, 2012. ^ "Ryan Wagner selected as new voice of Oriole Park | orioles.com: News". Baltimore.orioles.mlb.com. February 21, 2012. Retrieved November 23, 2012. ^ "1953 San Francisco Seals pre-season scorecard". bigdunker.com. Archived from the original on January 7, 2009. ^ "The Baseball Biography Project". bioproj.sabr.org. Archived from the original on April 21, 2007. ^ "Joe Medwick Statistics and History". baseball-reference.com. Retrieved April 9, 2011. ^ "Paper of Record". Paperofrecord.hypernet.ca. Retrieved November 23, 2012. ^ Meoli, Jon (March 22, 2018). "Second baseman Brian Roberts, radio broadcaster Fred Manfra to join Orioles Hall of Fame". The Baltimore Sun. Retrieved August 9, 2018. ^ "Orioles-Nats weekend series gives beltway something to be excited about". Retrieved April 7, 2013. ^ "Beltway Series 2011: Birdland Bias". Retrieved April 7, 2013. This page was last edited on 16 April 2019, at 00:24 (UTC).